Cinco de Mayo couldn’t have come at a better time. Although I haven’t indulged in the obligatory libation (yet), I have a belly full of tacos and am coming back to life after a punishing weekend of heat, hills, and more hills at Wildflower. This is a long post – probably my longest to date, but also one that marks a significant milestone in my race experience. 5 hours of sleep – ready to crush! 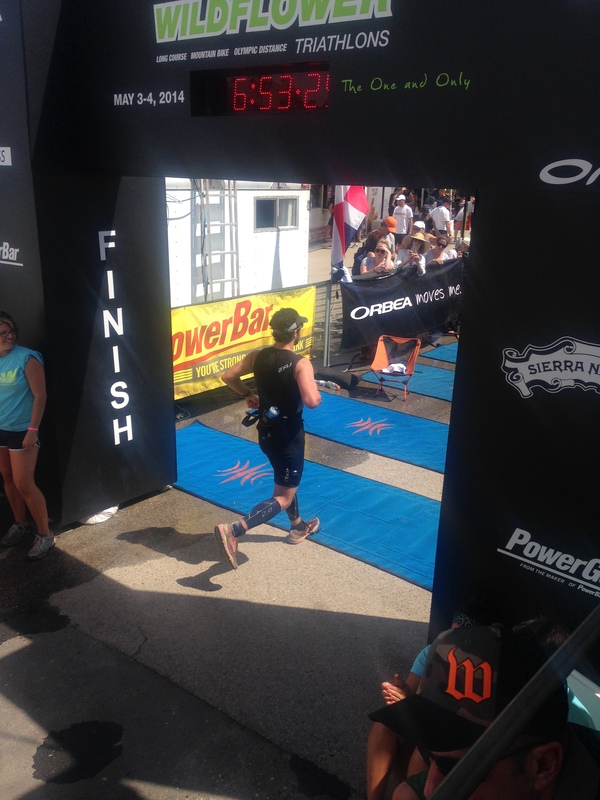 Spoiler alert: I finished in 6:38 – almost a full hour off my half Ironman PR of 5:44, 23 minutes slower than my first 70.3, and 40 minutes slower than my 2012 Long Course race…and it’s ok. 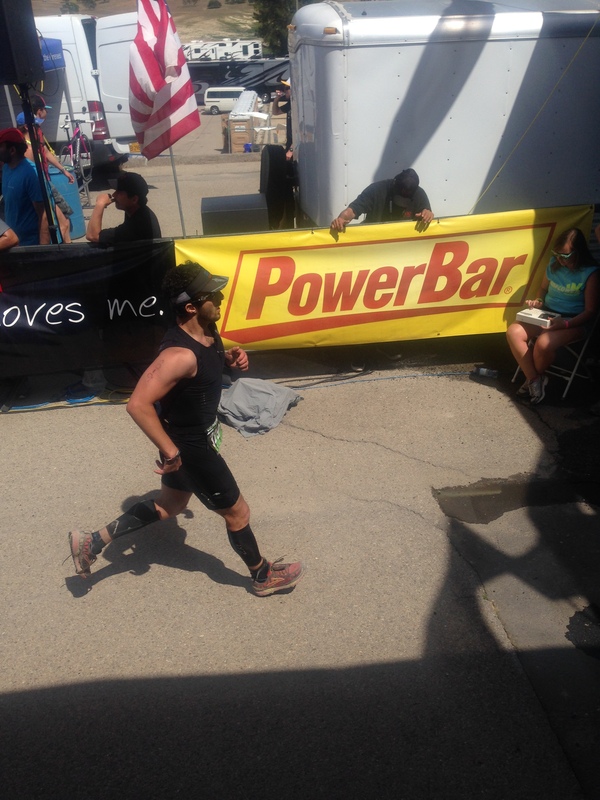 In short – Saturday’s race absolutely crushed me: I blew up on the bike. Due to the heat and the nutritional challenges it posed, I seriously considered taking a DNF after the bike but bounced back to finish strong. Swim: The much hyped swim venue change certainly introduced some logistical challenges this year. After setting up transition 2.2 miles away, athletes were shuttled down to the swim venue with running shoes and gear bags in tow. After the swim, racers ran back to the transition area and hopped on the bike; the transition run was ultimately deducted from the total run distance. That said, the swim was fairly straightforward, except for the fact that I forgot my goggles! I realized it moments before I got on the shuttle, but lucky for me, Sports Basement came to the rescue once again and hooked me up with a new pair just before the final shuttle left for Harris Creek. I hopped on the shuttle, regained my composure, and hopped right into my wave in time for the start. The start was a bit surprising – especially because I couldn’t see a thing! The water level was low enough to begin with, but disruption from thousands of athletes meant that the shallow swim start translated to opaque water – the first 100 yards were like swimming through tar. Once I hit the first buoy, I opened up my stroke and calmed down with plenty of time to spare. I felt extremely strong and knew that I was having the best swim of my 70.3 career. After turning the corner for the return trip to shore, I pushed within reason and clocked a 34 minute swim despite the difficulty sighting during the swim start and exit – 4 minutes faster than 2012, and 3 minutes faster than my second best time overall. It was an absolutely perfect start to the race, and I shot off to the transition run in full stride. Transition run: Disclaimer- I still haven’t uploaded my Garmin data yet and there isn’t a clear indication of how long I spent running on the results page. That said, it was another good effort before the main bike and run legs. 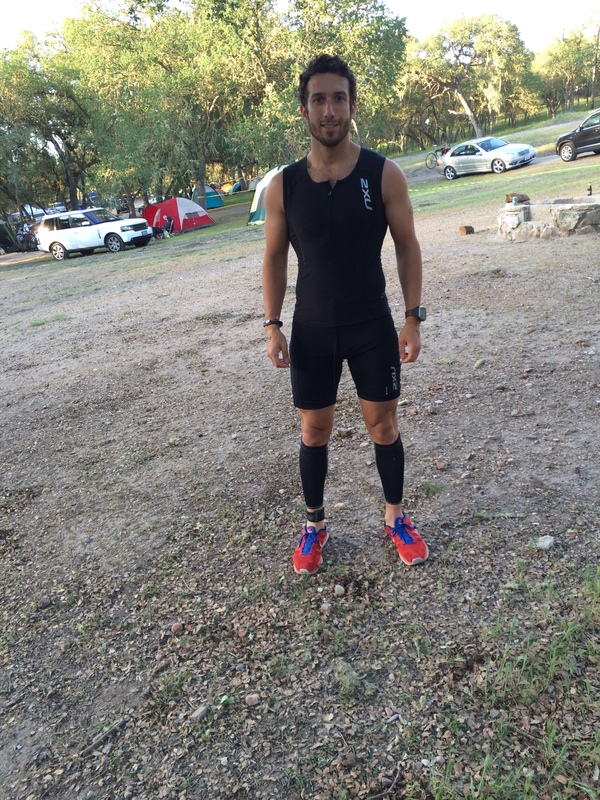 Despite the very steep incline of the swim exit/boat ramp/transition run area, I managed to briefly sit down, strip my suit off and throw on my triathlon running shoes – Altra 3sums. The beauty of these shoes is that they’re designed for sock-less use and even have drainage holes in the sole; they also have quick draw laces to save precious time in transition. Once I was equipped, I shot off on the trail and spent approximately 20 minutes changing and then running 2.2 miles – I felt great. It was realllly hot out there! Bike: 56 miles, unrelenting terrain, and extreme heat. I always go for the hardest races, and it was only a matter of time until I paid the price. I didn’t expect it to happen on Saturday due to my current fitness level, preparation, and familiarity with the course, but it did – in a big way. The ride started off as expected – I powered up the first substantial climb out of transition almost effortlessly and passed many people in the process. I had a lot of space ahead and saw very few riders – I was well into the top half of all racers following my swim, run, and first climb. Then it happened: it was almost like someone turned the thermostat to 100 degrees. As soon as I hit direct sunlight, I felt my core temperature creep up and my power output decrease. I stuck to my nutrition plan – roughly 300 calories per hour with increased fluid and sodium intake. The first hour was average – I hit the hour mark with just over 18 miles in the books, but maintaining my pace started to become difficult around mile 20. By the time I hit the headwinds, crosswinds, and rolling hills (mountains) between miles 20 and 35, I could safely say that I was already struggling and felt my hamstrings beginning to cramp. I started to spend less time in aero – something I’ll come back to later in the recap, and just focused on managing my skyrocketing heart rate in the heat. I hit the two hour mark with roughly 37 miles in the books – something I felt very good about under the circumstances. After a brief surge between miles 36-41, the infamous Nasty Grade made its presence felt: all 5 miles and 1000+ feet of climbing. While I was climbing, both the thermometer and my heart rate followed suit – I soon experienced cramping in my quads too. By now, I had cramped in my hamstrings and quads and my power output dropped significantly. I rode as easy as possible and used it as a time to replenish my sodium, fuel, and hydration needs – none of which did the trick: I was too far in the hole. I powered through the final 10 miles of rolling hills and prepared mentally for the strenuous 11 mile trail run in scorching heat that was only minutes away. I ultimately clocked in at 3:22 – a decent effort under the circumstances, but far off my 3:06 bike split in 2012. After dismounting my bike, I immediately knew that I was in serious trouble. 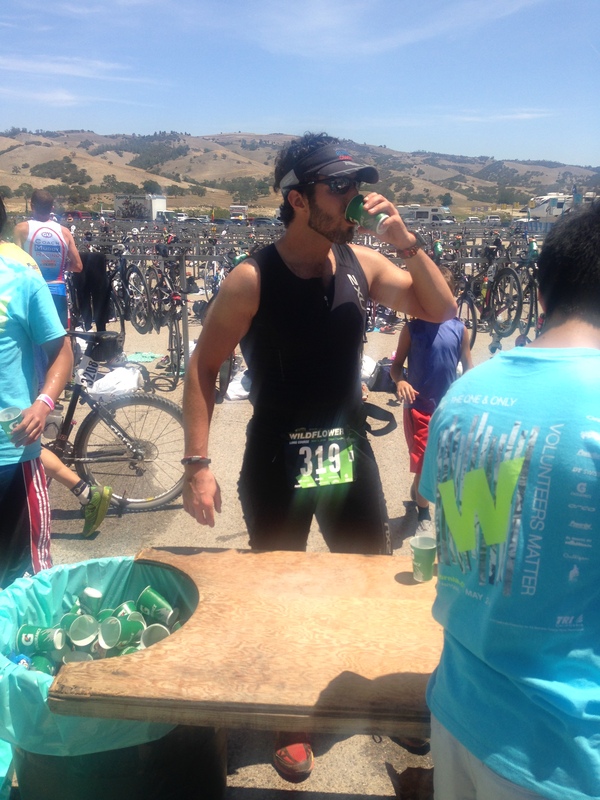 I was very dizzy, thirsty, and disoriented – telltale signs of dehydration and the early onset of heat stroke. I ate and drank as much as I could keep down hoping that it would do the trick and make me snap back to life – it didn’t. I spoke with Taylor briefly about taking a DNF and she was obviously concerned by my appearance. I ultimately decided to start the run leg by walking in an attempt to let digestion take its course. One shoe untied and the other foot heel striking: proof that I was cashed. Finishing as strong as I could. Run: The run leg was not looking good from the start: I spent almost 20 minutes in transition before I regained my composure. Taylor broke the news that Jesse Thomas bagged his 4th consecutive Wildflower Long Course victory after a year on the sidelines – something that really blew my mind and ultimately pushed me out of T2. 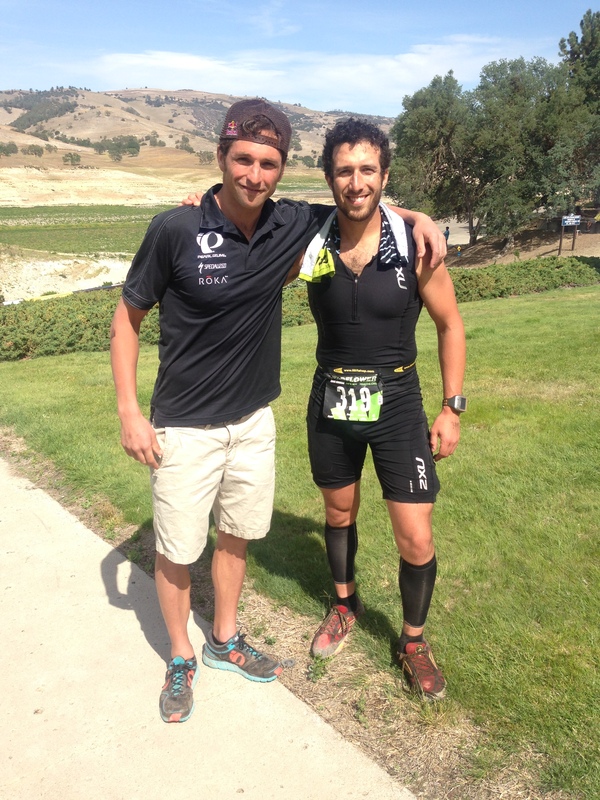 We also met briefly after the race – he’s a super cool guy, has a great first name, and really crushed it this weekend by capping a truly inspirational comeback. 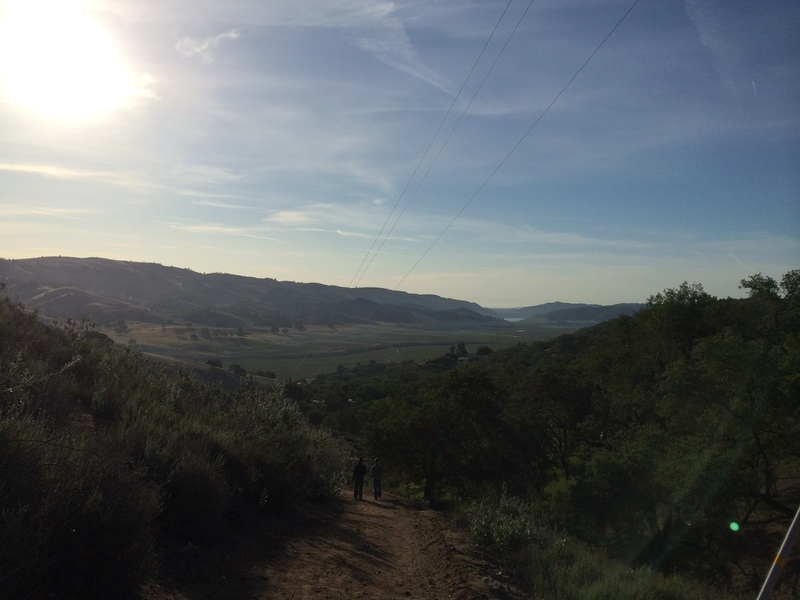 I walked out of transition for maybe the first time ever and up the first hill – another first. Jogging started on the descent, and my legs were starting to come back. More importantly, I felt the need to pee again – which meant that my body was responding well to my last ditch hydration effort in T2. After getting sprayed by hoses and kids with water guns at the first few aid stations, I felt my legs come back and broke into a solid running pace. 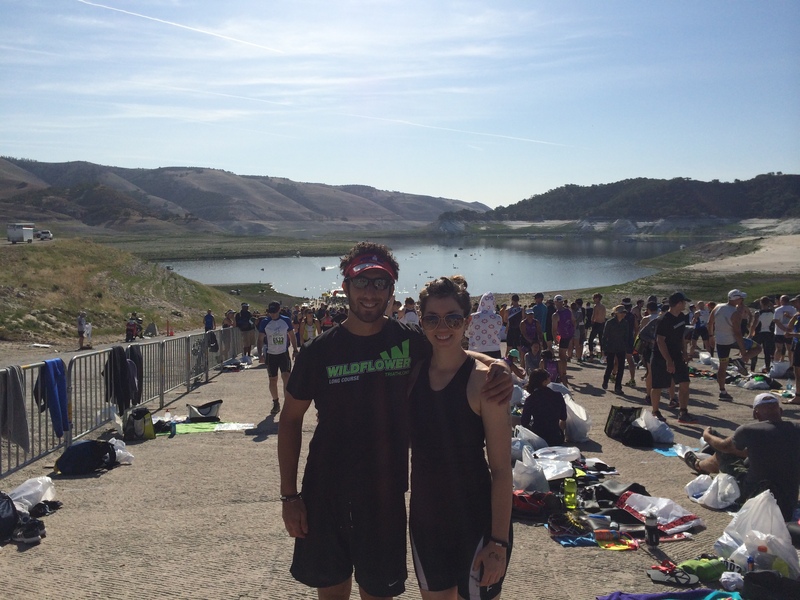 My moving pace was between roughly 7:45 and 8:15 – right where I want to be at Vineman 70.3. I walked the big hills and whenever I felt my heart rate skyrocket, eventually finishing the “run” in 2:13 – 12 minutes slower than my 2:01 in 2012. The finish: Adding up the sum of the parts, I clocked in at 6:38. My primary splits were 34 swim, 3:22 bike, and 2:13 run – not a bad effort for Wildflower, especially when a PR wasn’t my primary focus. I finished the race very strong and ran the last three miles at pace – my fastest mile of the run was mile 13. Posing with 4-peat winner Jesse Thomas! For starters, it’s not time to push the panic button. I will write a separate post where I revisit the goals I laid out last week and analyze my performance on Saturday, but in short – I hit almost all of them. The time is obviously disappointing, but it was a different race than 2012 under a different set of circumstances. I had an incredible swim. I could have swam a good amount harder and estimate that I had 2-4 more minutes of improvement in the tank. My mentality. I clawed through 2/3rd of the bike and most of the run under dire circumstances, all exaggeration aside. My exertion. I held back enough that I feel tired, but not cashed today. I’m ready to continue my training and don’t anticipate any downtime. The final 5k of the run. I got my bearings and hit it hard for a strong finish. Making the most out of the situation. After traveling extensively in recent weeks and training for a month less than 2012, it came together in the end. It was a long training day. A very long one. And that’s exactly what I set out to do. Jesse Thomas told me it was a “slow day” out there. He was right – the transition run and heat led to slower run and overall times. Race travel. Taylor and I arrived around 9pm on Friday night and my transition area opened at 5:30am. I needed to pick up my packet, set up transition and hop a shuttle in 2 hours or less – a mad rush that left me goggle-less until the very last minute. Pre-race preparation. I didn’t have sufficient time to stretch or shake out on Friday following the 5 hour car ride. This left me feeling tight and sluggish on race morning. Pre-race sleep. I slept for 5 hours and 5.5 hours in the 2 nights leading up to the race. Not good. Gear selection. I’ve rented race wheels for my last few big races and I’m convinced that they’ve played a hand in my success. Aerodynamics aside, they weigh less than stock wheels and accelerate faster – something that could translate to significant time savings on hilly courses. Plus, how cool do they look? Flexibility. I was incredibly stiff before and during the race. Part of this can be chalked up to the Not-So Good factors listed above, but I am ultimately accountable for the lack of stretching and foam rolling in recent months. This was key to my success in 2012, and I’m doing a very bad job of prioritizing flexibility this year. Work travel before the race. I traveled on Monday and Tuesday last week – something that undoubtedly impacted my ability to eat well and train right. My lack of training in the heat. This was the first really hot day I’ve experienced all year, and it just so happened to come at the worst time. I wilt in heat and have succeeded in the past by training in representative conditions – I will be doing more of this before Vineman. My nutrition plan. I executed it better than ever and it wasn’t enough. Although it’s worked for me in the past, it failed miserably on the bike and undoubtedly played a part in my cramping. I will be reevaluating this in upcoming weeks. All I can say is congrats for pushing through this tough race and finishing strong. Rough conditions can be so mentally and physically challenging. I know it is frustrating to be in such great shape and have a disappointing finish but I am certain you will be stronger than ever for your next race because of it. Congrats on finishing strong. Thank you! It is frustrating but good lessons came out of it. Interesting re-cap. Congrats on the finish. I have done WF 4 times(09, 10, 11, 13) and I know how brutal the course!! I can’t believe there is no lake! I decided to do Big Sur marathon instead of WF this year and it sounds like I made the right decision. I have met Jesse(Thomas) a few times and was excited he won for a 4-peat! Four times? That’s incredible! It’s so weird to see the lake completely empty. I bet Big Sur was gorgeous, that one is definitely on our bucket list! Yes! Crazy right?! But like you I like to pick the hard races! I thought I would stop after 3 but glad I went back for a 4th for a huge PR! 🙂 I could never go back and be happy but we will see!! Sounds like a tough day. But, as you said, this wasn’t an A race. So, nice job on a very long and difficult training day! Thanks! It was a long day for sure. Congrats on a strong finish to a tough race. Especially with the lake at 4%, which is nothing and the crazy heat we had in the area the last week! Yes! It was so ridiculously hot. Sounds like a tough day. Congrats on toughing it out in the end and finishing strong! Nice job out there! It was a super tough day but you conquered it. There is still a lot left to the tri season. Great job! Thank you! I read your report and taking a DNF on Saturday was a wise move – heal up and get back out there!